There are some books that I love to revisit once in a while. It is great to read my notes, and the parts I highlighted. Yesterday I pulled out from the shelves a little book that to my surprise I read in 2009 (I couldn't believe it had been such a long time since then! ), the book was written by C.H. 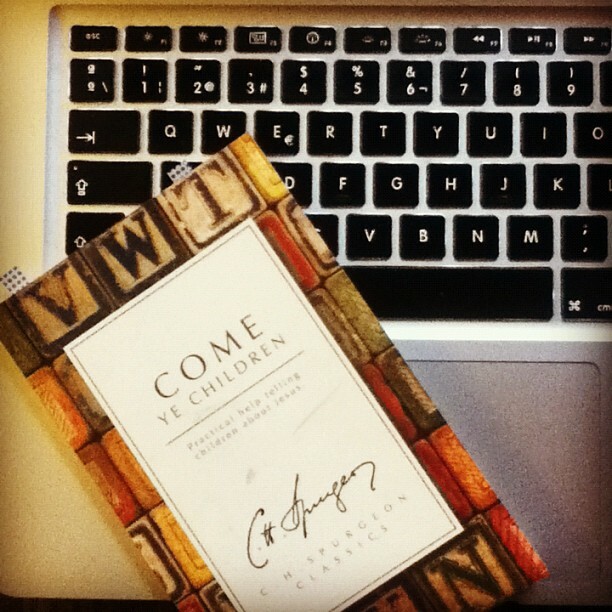 Spurgeon and is entitled, Come Ye Children: Practical Help for Telling Children About Jesus. This is a book full of practical help based on biblical principles to encourage us (parents, teachers, and pastors) to do well and with passion, the task we have before us of training our children in the Truth. "As we sow we reap. Let us expect our children to know the Lord. Let us from the beginning mingle the name of Jesus with their ABC. Let them read their first lessons from the Bible. It is a remarkable thing that there is no book from which children learn to read so quickly as from the New Testament: there is a charm about that book which draws forth the infant mind. But let us never be guilty, as parents, of forgetting the religious training of our children; for if we do we may be guilty of the blood of their souls." "Believe me, your children need the Spirit of God to give them new hearts and right spirits, or else they will go astray as other children do. Remember that however young they are, there is a stone within the youngest breast; and that stone must be taken away, or be the ruin of the child. There is a tendency to evil even where as yet is not developed into act, and that tendency needs to be overcome by the divine power of the Holy Spirit causing the child to be born again." "Teaching is poor work when love is gone, it is like a smith working without fire, or a builder without mortar. A shepherd who does not love his sheep is a hireling and not a shepherd; he will flee in the time of danger, and leave his flock to the wolf. Where there is no love there will be no life; living lambs are not fed by dead men. We preach and teach love: our subject is the love of God in Christ Jesus. How can we teach this if we have no love ourselves?" "There must be doctrine, solid, sound, gospel doctrine to constitute real feeding." "Lay much stress upon this; tell your children that the Word of the Lord is a pure Word, as silver tried in a furnace of earth, purified seven times. Let their esteem for the Book of God be carried to the highest point." "This book is the Word of God, and if we teach it, we teach that which the Lord will accept and bless. O dear teachers -and I speak here to myself also- let our teaching be more and more Scriptural!" Fret not if our classes forget what we say, but pray them to remember what the Lord says. May Divine truths about sin, and righteousness, and judgement to come, be written on their hearts! May revealed truths concerning the love of God, the grace of our Lord Jesus Christ, and the work of the Holy Ghost, never be forgotten by them! May they know the virtue and necessity of the atoning blood of our Lord, the power of His resurrection, and the glory of His second coming! May the doctrines of grace be graven as with pen of iron upon their minds, and written as with the point of a diamond upon their hearts, never to be erased! If we can secure this we have not lived in vain. The generation now ruling seems bent on departing from the eternal truth of God: but we shall not despair if the gospel be impressed upon the memory of the rising race." "God blessing your efforts, dear friends, your children may know all of Scripture that is necessary to their salvation." "We cannot advance a step by doubt; our only progress is by faith... Believe God and and thou hast made progress. So let us pray for our children, that constantly they may know and believe more and more; for the Scripture is able to make them wise unto salvation, but only through faith which is in Christ Jesus. Faith is the result to aim at; faith in the appointed, anointed and exalted Saviour. This is the anchorage to which we would bring these little ships, for here they will abide in perfect safety." "Sound Instruction in Holy Scripture, when quickened by a living faith, creates a solid character." "Children need the gospel, the whole gospel, the unadulterated gospel; they ought to have it, and if they are taught of the Spirit of God they are capable of receiving it as persons of ripe years... Be encouraged; the God who has saved so many of your children is going to save many more of them, and we shall have a great joy as we see hundreds brought to Christ." "It is not your instruction that can save the souls of your children; it is the blessing of God the Holy Spirit accompanying your labors. May God bless and crown your efforts with abundant success! He will surely do so if you are instant in prayer, constant in supplication." "I beseech you, never treat child-piety with suspicion. It is a tender plant; do not brush it to hard." "Mothers, the godly training of your offspring is your first and most pressing duty. Christian women, by teaching children the Holy Scriptures, are as much fulfilling their part for the Lord, as Moses in judging Israel, or Solomon in building the temple." "Your business is not merely to teach children to read the Bible, not barely to inculcate the duties of morality, nor even to instruct them in the mere letter of the gospel, but your high calling is to be the means, in the hand of God, of bringing life from heaven to dead souls." Let us not grow weary, friends, let us preach the Word of God to our children from the moment they open their eyes to the moment we kiss them good-night.